Robotic pool cleaners might just be one of the best innovations exclusively made for swimming pool maintenance. These cleaners are convenient and practical go-to equipment, especially for residential pool owners. It saves you the hassle of brushing the sides and floors of your pool without compromising the pool's filtration system. Another benefit is that you're actually keeping your pool healthy and clean! Could it get better than that? You're spending a lot of your time, energy and resources to get your pool cleaned. So, if you're looking for a pool cleaner that would do all of these things, then the Polaris P825 robotic pool cleaner might be what you're looking for. The Polaris P825 navigates your pool's surfaces smartly. It can climb walls and steps, and could even scrub tile lines for a more flourished look. You don't have to hang around your backyard just to check if this robotic pool cleaner is really doing its job, or to get it out of obstacles when it's stuck. It's that smart to do it on its own. Aside from that, this specific Polaris vacuum cleaner is equipped with a patented Cyclonic Vacuum Technology. This kind of technology ensures powerful cleaning action that captures any type of debris without losing its suction. The only time that you will need to get your hands on this is when you're about to start cleaning the pool as you set it down, and when it's finally done cleaning, it's really easy for you to clean out the debris with its Push'N'Go filter canister. The Push'N'Go filter canister makes it easy for pools owners to remove the pool cleaner's debris with just a simple unlocking. You don't have to go through the hassle of dismembering parts out, or worry that you might be doing it the wrong way. The canister also has a large transparent viewing window so you can see if there are still pieces of debris left inside it. It’s really easy to get the filter out of the canister. Gone are the days when you have to either pull the debris out or touch it just to remove it from the filter. The Polar P825 is also built with additional features like the Surface Control System. This feature can make it easier for you to adjust pool surface settings for optimal wall climbing, the dual-cleaning cycle for one-touch and on-demand cleaning cycles. This product also comes with a durable caddy for easy transport. 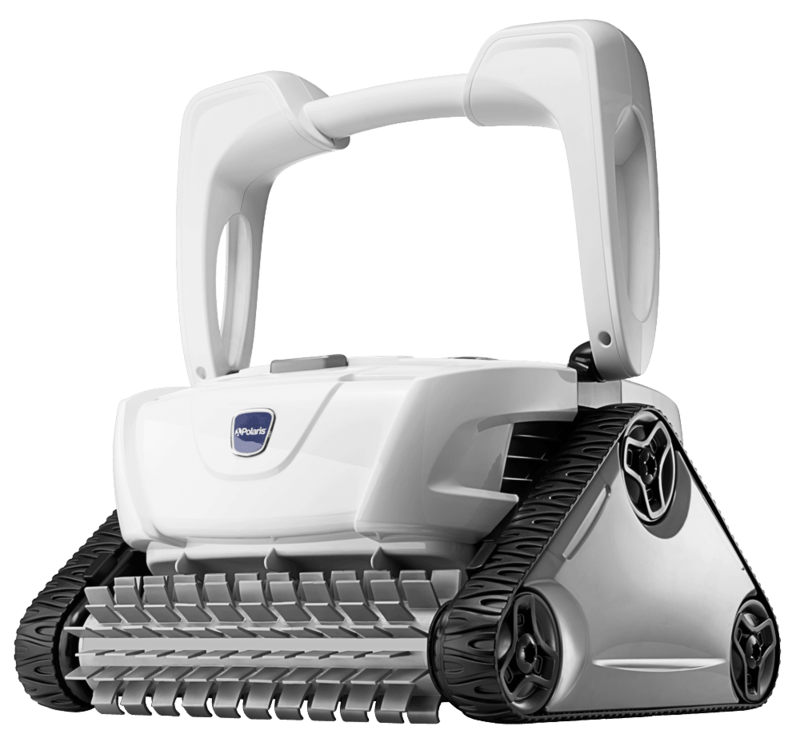 Since the P825 is also designed to have tank treads and a single front brush, this can surely handle more steps, coves, seats, and tiles than your average robotic pool cleaner. Skip the manual and tedious way of cleaning out your pool with the Polaris P825 robotic pool cleaner. Q. Can it be programmed to automatically turn on and off daily? Ans : Unfortunately, it cannot be programmed to turn on and off automatically daily. However, you would only need to press the start button for it to start and get things done and it will power off on its own after the cleaning cycle. So even if it does not have programmable settings, the pool cleaner can still function even without your supervision. Q. How long is the power cord? Ans : The power cord which is directly connected to the power outlet to the base of the unit is not that long (only 2 feet in length). The floating cord, however, is 50 feet in length. Q. Does this serve as a brush too? Ans : Yes, it does. The Polaris P825 does not only work as a pool vacuum cleaner but brushes your the walls and in-between the tiles too. Actually, this product comes with two pleated brushes which can effectively sweep hard-to-remove dirt away. Q. Can this pool cleaner climb the walls of my pool? Ans : Yes, it can! It cleans not only the flooring of your pool, but it also goes all the way up to the sides. You don't have to look back and clean whatever this cleaner missed out. It cleans every square inch of your pool all on its own. Q. Will this lose its vacuum suction when cleaning? Ans : No, it won't the Polaris P825 is designed to have a cyclonic vacuum technology which won't fail to lose its suction when cleaning. One of the most important features of any robotic pool cleaner is to adhere well on the pool surfaces to ensure proper and effective cleaning and that's exactly what the P825 does. The Polaris P825 is one of the most reasonably priced pool vacuum cleaners that is available in the market today. This product will really come in handy especially if you're still transitioning from manual cleaning to having a robotic pool cleaner. Starting up this pool cleaner is not hard at all. You just have to plug it in and leave it to clean. Skip the hassle of learning how to program it. Just put it out when you need it and put it back out if you're done. With its cyclonic vacuum technology, easy to remove filter canister, effective Surface Control System, and a premium and easy to assemble caddy, there’s really nothing else you can ask for from this robotic pool cleaner. It’s definitely worth buying. 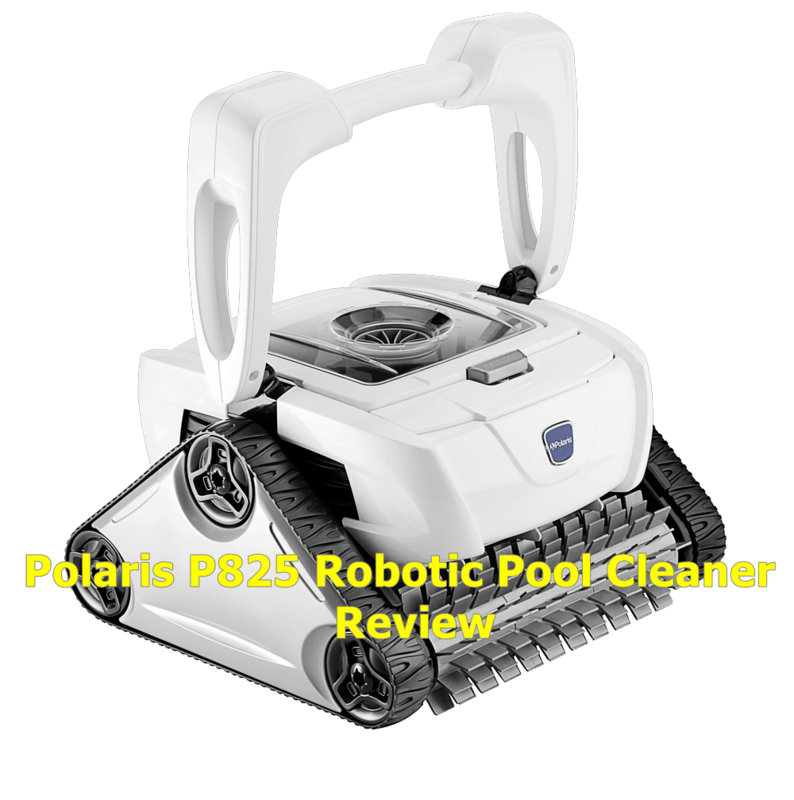 Overall, the Polaris P825 surpasses all expectations on how a simple robotic cleaner should be.